Appolonia City and Ghana Home Loans are offering the country’s only 10-year mortgage that allows buyers to start building their dream homes with just a 20% deposit. 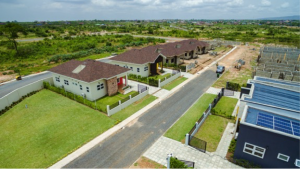 Appolonia, a city-sized development just 20km from Accra CBD, and Ghana Home Loans, the country’s leading home finance institution, have partnered to provide a 10-year mortgage on serviced plots in Nova Ridge, Appolonia’s “buy-and-build” neighbourhood. The mortgage, the first of its kind in Ghana, enables buyers of Nova Ridge serviced plots to make a minimum deposit of 20% of the land value and then spread the balance in monthly payments over a 10-year period. Purchasers can also access a home construction mortgage from Ghana Home Loans. The management of Appolonia, which is being developed by Rendeavour, Africa’s largest urban land developer, say that Nova Ridge III buyers with a 10-year mortgage will enjoy all the benefits of a new city.